Yes, out of control is the phrase most people use (okay, yell out in desperation) to describe their lives only when their multi-tasking skills are pushed to their limits. If you listen beyond the phrase itself, however, it’s what is not said that is so remarkable. Most people feel like their lives are out totally in their control most of their waking hours. Simply put, people who momentary experience life as being in their control flow downstream with the full force of habit pushing them through life. Over time, it’s hard not to be dulled into believing that life flows constantly, that the waters of life are smooth and unchanging, easily navigated and predictable, the same today as they were yesterday. Doing isn’t nearly as important as being as care can’t always be reduced to a set of tasks. 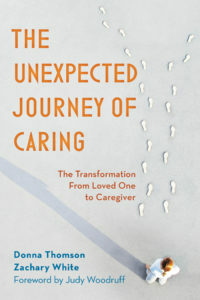 Caregiving involves tasks, no doubt, but care can never be fully represented in an Outlook Calendar. What do you put down? How do you explain your care to others? When does your care begin and end? Care can’t be objectively measured, timed, and evaluated. Nothing about caregiving is objective. It’s nearly impossible to place a value on your time and on the gifts you do receive from being with and near a person you love. Nor can care be talked about in the language of efficiency. Talking about care using the language of efficiency is as silly as trying to figure out how to love someone more efficiently—it just doesn’t make sense. And perhaps most importantly, your care for another is so very challenging to explain to others. What can care be compared to that accurately and fully captures the fact you both want to do it and you don’t want to do it, you wouldn’t trade your position for anyone else’s but, at times, you wish someone else would relieve you of the exhaustion that accompanies going to sleep every night worrying about what can’t be done. Caregivers share one unstated but earned assumption of everyday life with other caregivers: Life is often experienced as if it is just beyond our control. Doctor’s appointments, expectations, hopes, plans, time, love, and work are constantly experienced anew, each day, as if yesterday was unrelated to the day before, requiring constant and detailed attention to the very aspects of living that so many others forget even exist. When faced with these realities, we, as caregivers, however, do get to practice something most others don’t or can’t know. When we stop obsessing about being in control, the fragility of now requires us to be completely present with another for all we know for sure is that we have the moment before us. Everything else, well, it may be beyond our control.